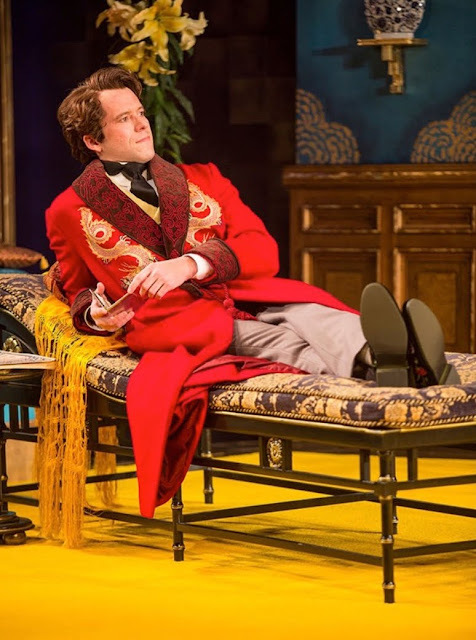 “The Importance of Being Earnest” is currently in a stylish production at the Old Globe Theatre in Balboa Park through March 4th. It's Wilde’s most popular commentary on Victorian attitudes, morals and manners. It's hypocracy personified. More fun than a barrel of monkeys, Wilde’s wordplay comedy hits directly at the absurdity of 19th century upper class ethics. Jack knows The Hon. Gwendolen Fairfax will be visiting his friend Algernon at his home. Once together, he proposes marriage and Gwendolen accepts. After some discussion she divulges that she is love with the name Ernest and believes that’s his Christian name. There is another minor issue added to Jack’s tsoris about his birthright. Algernon finds Jack’s cigarette case with Cecily’s name engraved on it. He taunts his friend to an almost show down believing that Jack is having an affair with someone named Cecily. Unbeknownst to the other, they are more connected at the hip and more alike than theywould ever admit. 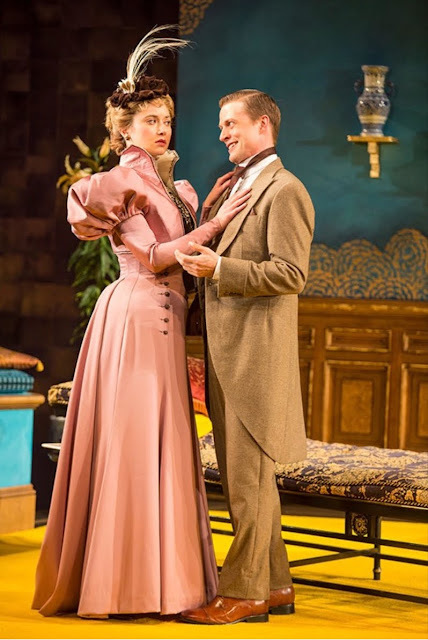 Lady Bracknell snubs her nose at Jack and dismisses his claim to her daughter until… well you have to follow the dots on this unfolding saga; it’s almost too good to be true, but it’s Wilde’s wild ride and fun to watch unfold. Algernon (Christian Conn) his friend has the same dueling personalities in his portfolio as Jack. They both neeed time out of the city/country. Some know him as Algernon (in the city) and some as Bunbery (when he wants to get away from the city). Neither Ernest nor Burberry exists, but they allow Jack and Algernon to play the field as bad boys in a social climate that frowns on anything less than proper. 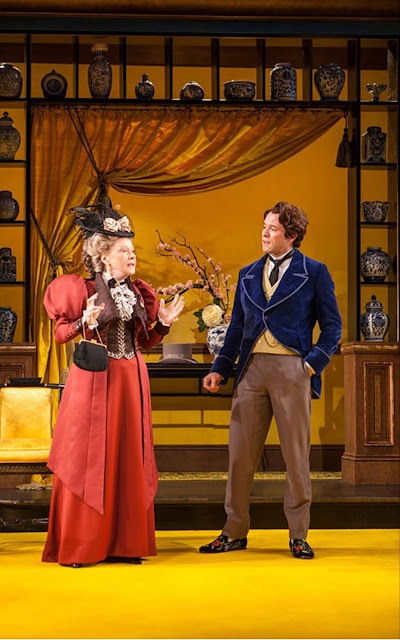 This type of behavior plays havoc with Gwendolen and Lady Bracknell’s (Helen Carey) and with Jack’s (young) ward Cecily (Helen Cespedes) who lives in the country and only knows him as Jack. Everyone is dragged into this mish-mash as all hell breaks lose, in the most, ahem, refined manner. It all unfolds, of course in the gentrified country estate of Jack Cardew. The first time I saw “The Importance of Being Earnest” at the Old Globe was in 1982. Elis Rabb played Lady Bracknell in drag and Tom Moor directed. 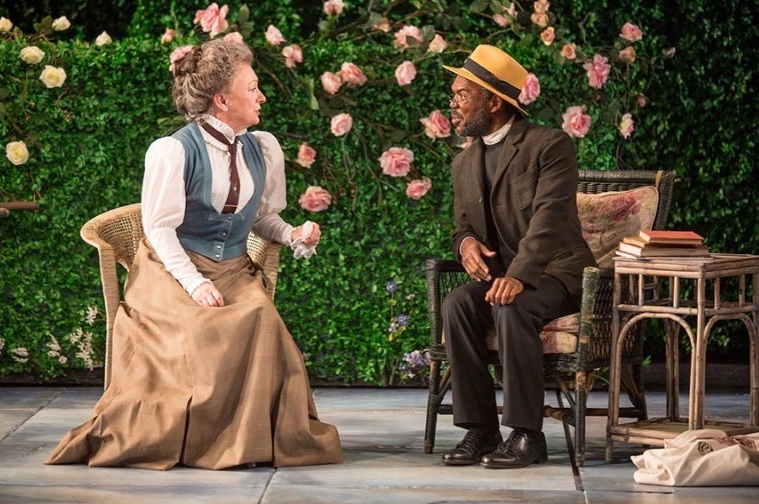 Since, The Old Globe has mounted Wilde’s most popular play several more times over the years. It’s important to see it often and relish the characters for who they are and especially what they say. In this case of this production directed with a comic flair by Maria Aitken and dressed to the nines in Fabio Toblini’s gorgeous Victorian costumes, each and every one carries off their respective personalities with the bliss they exude when they speak, to the looks they give each other when making a point. At the center of this collision is Christian Conn’s absolutely wonderful Algernon. If anyone can stir up the dust he has a way to do it. He openly, yet behind the scenes (especially in the country with Cecily) manages to put everyone on notice to that effect when he shows up at Jack’s country estate as Ernest, Jack’s brother. All hell breaks lose when Jack comes in in morning clothes announcing that Ernest just died. The looks on both the men’s face’s is worth the price of admission. Matt Schwader is the opposite side of Algernon’s personality. He’s as serious and tense as Conn’s Algernon’s is full of life and vigor. Together they keep the story moving. Kate Abbruzzese is about as straitlaced as is her new fiancé, but with a bit more emphasis on the pretense. She and Cecily finally meet when all are gathered at Jack’s country estate. The contrast in personalities couldn’t be more obvious even though, strangely they share simple ideas; they both keep diaries and they both must marry men whose names are Ernest. Ms. Cespedes and Abbruzzese are as perfect a pair as Algie and Jack snapping, bickering and picking at one another. Gwendolen however has one advantage, she is used to looking down her nose at other women. 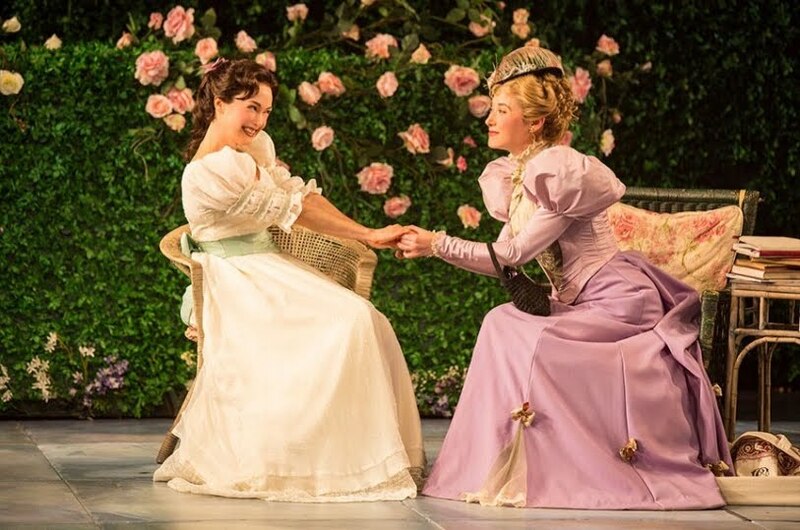 Cecily: Do you suggest Miss Fairfax, that I entrapped Ernest into this engagement? How dare you? This is no time for wearing the shallow mask of manners. When I see a spade I call it a spade. 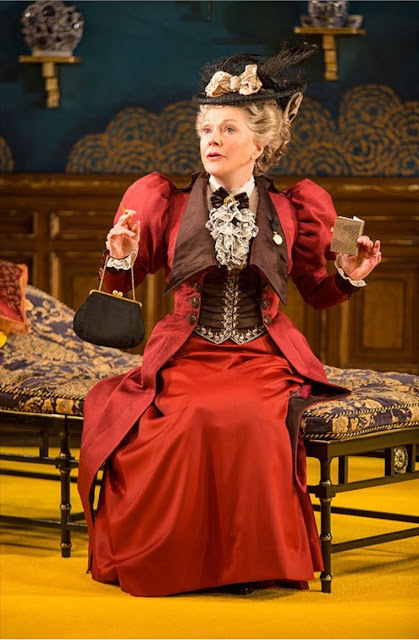 Helen Carey attacks the person of Lady Bracknell with all the pomp and haughtiness afforded the role. Sharp as a tack she swoops down on her prey never letting anything get in the way of her plans or opinion. She proves to be a master at it. And…I love her look; hat askew almost falling off her head with Toblini’s fitting outfits to die for. Jane Ridley’s Miss Prim, if you want to stretch a point, solves the riddle of Jack’s birth mix up and is of course the prim and proper governess to Cecily. She’s gaga over Rev. Canon Chasuble (Rodney Gardiner) who doesn’t seem to have a clue. Both go bumbling into the night and are a hoot to watch. Rounding out the cast Daniel Harray and Sam Avishay are fitting as Lane the butler, and Algernon’s valet, Merriman. Both are necessary if high- class society is to prevail. Hugh Landwehr sets are most extravagant looking in Act I but in the opening scene of Act II the country hedges look fairly familiar as in another production seen on this very stage. They do what they are intended; hide what’s behind them, they are a bit too overdone. Philip S. Rosenberg’s lighting only enhances that which is already finely tuned and Fritz Patton’s original sound and music add to the overall feeling of the play.